BP Oil Spill Crisis Communications Special. On April 20, 2010, an explosion on an oil rig licensed to BP in the Gulf of Mexico triggered an oil spill that has resulted in an ecological and financial disaster of global proportions. United States Navy Public Affairs Officer Jim Hoeft who is coordinating communications at the Official Site of the Deepwater Horizon Unified Command for the Joint Command Center in Louisiana briefs on the process communicating the worst oil spill in history via social media. The state of affairs at the Joint Command Center in Louisiana, and what’s being done to communicate the scale of the disaster. The approval process for communicating what is happening operationally. The National Response Framework chain of command and participating agencies. 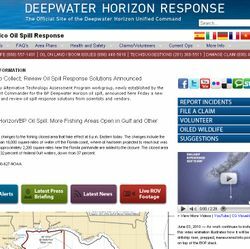 The Official Site of the Deepwater Horizon Unified Command is being managed on the PIER Response System with outposts on Facebook, Twitter, YouTube, Flickr and other social media sites. How they are responding to feedback on Facebook and Twitter. ”This is the first time that the Federal Government has tried to implement social media tools in a National Crisis,” says LTC Heoft. “We didn’t have this during Kartina. We didn’t have this during 9/11. We’re learning where online communications falls in the national response framework,” he continues, suggested that trending question occurring via social media can be used to help the Unified Command respond to issues that are most important to the public. The challenge of monitoring social media manually, since no good measurement or sentiment analysis tools exist. Using social media trend reports to provide feedback to command about the issues people are talking about most. Resources required to staff the social media monitoring effort and the use of Cover it Live to live blog developments. Prioritizing social media communications channels. Which social media channels have been most popular for disaster response? The shortcomings of Facebook as a Government crowd sourcing tool. The LMRP cap containment strategy, the latest effort to contain the leak. Online communications will definitely be part of the national communications framework moving forward. Using www.youropenbook.org to monitor public Facebook status updates.